Jayden Sink, 5, and her father, Jon Sink, set up a lemonade stand at Equality House on Friday, across the Street from Westboro Baptist Church. The money she raised will go to the organization that founded Equality House, Planting Peace. A five-year-old girl set up a lemonade stand "for peace" right across the street from a notorious church in Kansas which has been accused of spreading hate and homophobia wherever it goes. The purpose behind young Jayden Sink's beverages is to raise money for a nonprofit organization called Planting Peace, which supports orphanages, works to conserve rainforests and provides medication to poverty-stricken children all over the world. Sink's stand is in front of the group's "Equality House" — a rainbow-colored headquarters intentionally set up just 20 feet away from the front door of Westboro Baptist Church, which has become famous for picketing soldiers’ funerals, protesting in front of the Holocaust Memorial Museum and celebrating massacres like Sept. 11 and the Sandy Hook Elementary School shooting, all in the name of homophobia. While each panel of siding on Equality House is painted a different color to act as a foil to the heavily anti-homosexual agenda across the street, Planting Peace’s founder and president Aaron Jackson said the house is much more than a statement. Volunteers use the space to work on LGBTQ equality programs and anti-bullying initiatives. It was Jayden’s father, founder of a “creative compassion” project called Freshcassette, who inspired her to raise money for Planting Peace. Jackson said that Sink could not fully explain to his daughter what Westboro Baptist stood for, but did explain to her the mission of Equality House and she immediately wanted to do something. So far, Jayden’s lemonade stand has only been in business since Friday and has raised over $200, said Jackson. That doesn’t count over $6,000 that people who can’t make it to Kansas have donated to her crowdsourcing initiative on Crowdrise.com. 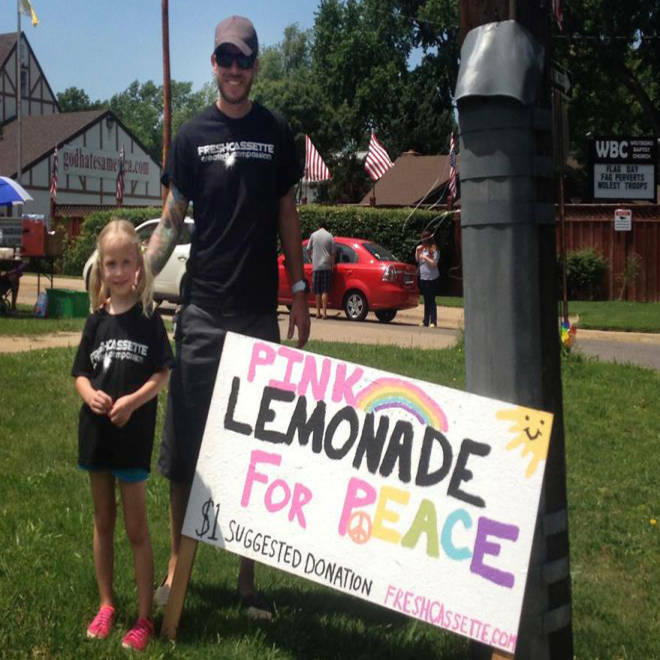 Jayden Sink and her father, Jon Sink set up a lemonade stand outside of Equality House in Kansas to raise money for Planting Peace. Jackson said members of the church were standing in the front yard on Sunday and were visibly aggravated.